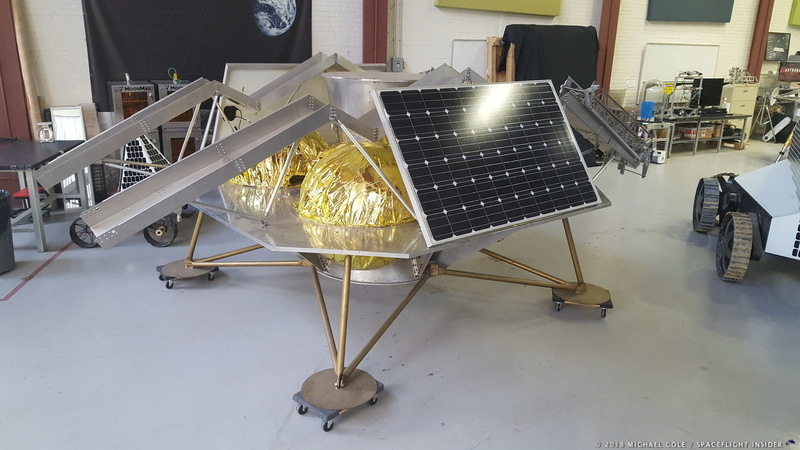 The Griffin spacecraft is the larger of Astrobotic’s lunar landers. Capable of delivering 500 kg to the surface of the Moon, Griffin may become part of NASA’s commercial partnership to deliver scientific payloads and hardware back and forth to the Moon from the proposed Lunar Orbital Platform-Gateway. The lander is shown with ramps extended for a top-loaded rover. Photo Credit: Michael Cole, Spaceflight Insider. PITTSBURGH, Pa. — Not far from downtown Pittsburgh is a somewhat drab commercial area of nondescript brick and concrete buildings, dating back to the days of when steel machine companies ruled the town. Notably, the former site of Westinghouse, where the original air brake was developed. Today, no passersby would suspect that one of these buildings houses a lab for a small fleet of spacecraft and rovers designed to go to the Moon. But Pittsburgh is also the home of Carnegie Mellon University’s Robotics Institute. It is one of the premier robotics research and education programs in the world, and from that well of talent, and a desire and energy to go to the Moon, came the formation of a company called Astrobotic. Astrobotic began in 2007 to compete in the $30 million Google Lunar XPRIZE. The contest challenged private enterprise to innovate and design their own low-cost spacecraft and technologies to accomplish three goals. 1). Successfully land a spacecraft or rover on the Moon’s surface. 2). Travel 500 meters and 3). Transmit high definition video and images back to Earth. “That was our catalyst to get started,” Astrobotic’s Chief Executive Officer, John Thornton, told Spaceflight Insider. Thornton has been with the company from the beginning, starting as a mechanical engineer and working from the engineering side over to the business side. He took over the company in 2012. While the Google Lunar XPRIZE might have closed with no winners, in terms of the the new robotics firm – the real winner appears to be Pittsburgh. 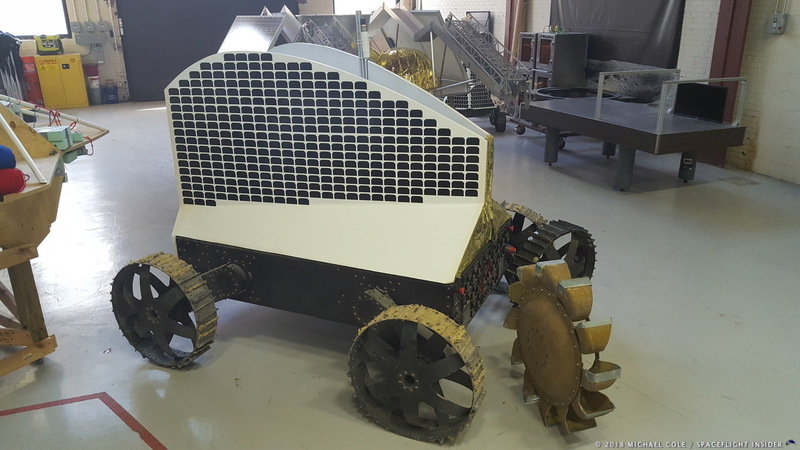 Astrobotic has developed two lunar landers. The larger of the duo, called Griffin, is capable of carrying 1,102 lbs (500 kg) of payload to the Moon. The smaller lander, called Peregrine, is designed to carry 265 kilograms (584 lbs). Both landers are designed to have rovers, experiment modules, and various commercial payloads bolted to the top and undersides of the landers. Upon landing, the payloads can then be activated, or dropped the short distance from the lander to the Moon’s surface to do their designed tasks. The landers essentially serve as a payload delivery service to the surface of the Moon. The company has also developed a number of lunar rovers designed to carry out different functions at different locations on the Moon. One of the rovers was fitted with a special digging machine, capable of digging a trench in the lunar regolith. With their landers and rovers and other technical successes, the company for a time was a favorite to win the $20 million grand prize of the GLXP. But in December of 2016, Astrobotic announced they were dropping out of the competition. Thornton stated at the time that the company needed to focus on its own new set of goals, and get away from trying to chase unrealistic prize deadlines. This past January, the GLXP itself was finally cancelled without awarding a winner. Nevertheless, Thornton thinks the contest more-or-less accomplished its goals. Today, Astrobotic’s major focus is on the first mission of the Peregrine lander. The manifest of this first mission, interestingly, includes the Japanese Hakuto rover, and Chile’s AngelicvM rover, both former contestants in the GLXP. “We have 11 deals so far toward mission one,” Thornton said. “We have 35 kilograms that we’ve made available commercially. Then we have an allotment that we’ve set aside for NASA for this upcoming payload purchase that we’re just now seeing the first steps of.” The company will not know the specifics of the NASA payload until later this year or early next year. NASA issued a Request For Information (RFI) last May, seeking ideas from industry on how the agency could possibly participate in uncrewed commercial missions to the Moon. Astrobotic’s NASA payload will likely be a product of that RFI. 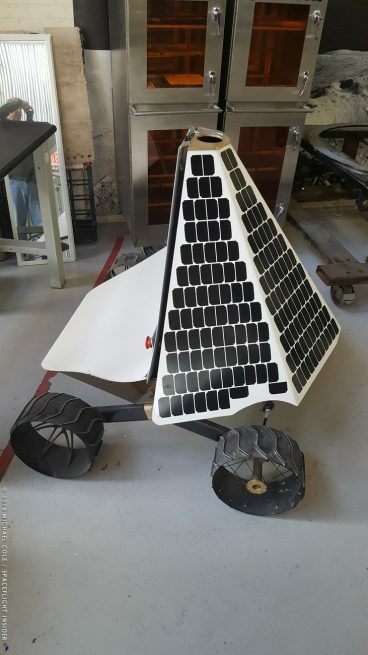 In addition to the privately developed rovers from Chile and Japan, a set of much smaller mini rovers will be carried aboard Peregrine from the Agencia Espacial Mexicana, or AEM, the Mexican Space Agency. It will be the first Latin American payload to the Moon. 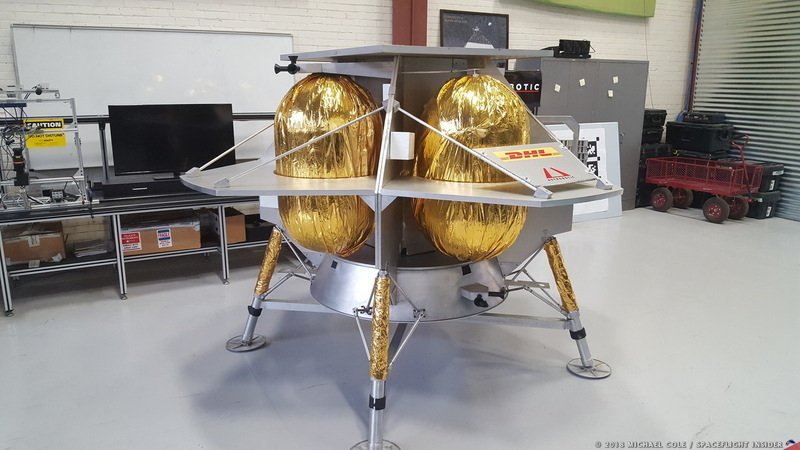 A demonstration of this accessibility to the Moon is Astrobotic’s partnership with logistics company DHL, making DHL “The Official Logistics Provider to the Moon.” The DHL sponsorship includes the DHL MoonBox, an opportunity for ordinary citizens to place small personalized mementos into containers that Peregrine will carry to the Moon. The containers can carry items the approximate sizes of a ring or a large coin for between $460 and $1,660. Last year Astrobotic signed an agreement with Atlas Space Operations to carry a laser communications terminal aboard Peregrine. The device will demonstrate the first optical communications capability on the lunar surface, giving gigabit-per-second bandwidth and enabling high definition streaming video to the other payload customers on the mission. Streaming video coming from the rovers deployed by Peregrine will be very useful to the payload customers, and likely of great interest to the public. Integrating these various payload packages onto the lander and truly making it a payload delivery service to the Moon is the job of Mission Director Sharad Bhaskaran. The first mission of Peregrine is planned to launch as a secondary payload on a United Launch Alliance Atlas V. The Centaur upper stage will then ignite and boost the lander to trans lunar injection (TLI). From there, Peregrine will take over. It is a single-stage spacecraft with five 100 pound-force engines, with a MON25 (mixed oxides of nitrogen, with 25% nitric oxide) propulsion system. From TLI all the way out to the Moon and landing is totally the job of the lander. The projected lunar landing site for Peregrine’s first mission is a place called Lacus Mortis, Latin for “Lake of Death.” But Thornton and the Astrobotic team are not intimidated by the name. The site was chosen because it is a mid latitude area with some large flat stretches that provide a safe and open landing spot. The team chose the mid latitudes because it misses some of the higher heat of the day nearer the lunar equator, but is not so far south that the terrain becomes challenging. Once on the surface, Peregrine will beam HD video and streaming content live from the Moon as the mission unfolds. Although Peregrine is capable of carrying 265 kgs (584 lbs), the first mission’s much lighter payload is intended to maximize the mission’s safety margins and give the spacecraft its best chance to prove its capabilities. When Thornton describes the company’s visionary business model and includes the part about landing on the Moon as a matter-of-fact part of the scenario, it does not mean they take that difficult technical feat for granted. Indeed, the company has invested considerable energy and resources in developing their own technologies which they believe will make those landings successful. The company developed a system of Terrain Relative Navigation (TRN) which uses a combination of stereo cameras and a laser or LIDAR sensor, along with software that includes detailed map imagery of the prospective landing site. “It works very similar to when you go hiking and you look at a hiking map and see there’s a mountain there and a stream over there and a lake over there, then I’m here relative to those features,” Thornton said. The TRN system was tested three years ago on Masten Space Systems rocket propelled suborbital reusable launch vehicle, Xombie, guiding the craft to a safe landing. The company believes their TRN landing system is the highest performance, lowest cost, lowest mass solution for accomplishing precision landing on the Moon. The first few missions of Astrobotic landers are expected to last one lunar day, or 14 Earth days. The first Peregrine mission and possibly the next two or three missions will land about two Earth days after local lunar sunrise. This is to ensure that the shadows are appropriate. If they attempt to land too soon after local sunrise, the shadows on the terrain will be too steep and too visually difficult to calibrate the TRN landing system. After landing, the spacecraft will operate on the surface for as long as it has sunlight to keep the solar panels alive. When the landing site passes into the 14-day lunar night, and temperatures drop to -170 C (-274 F), it is anyone’s guess if the spacecraft’s operability will survive the cold. The battery is only one part of the challenge, Thornton admits. In the intense cold of the lunar night, not only the battery needs to survive, but the instruments and other hardware. One popped solder joint could spell the end for a piece of equipment. And carrying a radioisotope heater unit aboard, as the Russian Lunokhod and Chinese Jade Rabbitt lunar rovers did, is out of the question for a small private space company. But Astrobotic believes they will eventually overcome the thermal challenges of the lunar night. Thornton’s lunar visions for the future may not be as far off as they seemed just a year or two ago. Or even a few months ago. President Trump’s 2019 NASA budget proposal outlined a new emphasis on getting spacecraft, and eventually astronauts, back to the Moon. The proposal described sending a power and propulsion module into orbit around the Moon to serve as the beginning of construction on a Lunar Orbital Platform, previously referred to as the Deep Space Gateway. According to the proposal, the power and propulsion module would be sent to the Moon in 2022. Of even greater relevance to Astrobotic, the plan envisions using commercially developed lunar landers to transport experiments, hardware, and eventually astronauts, back and forth from the station to the surface of the Moon by the end of the 2020s. That plan seems to be getting underway. On March 8, NASA announced its intention to enlist a series of robotic landers and rockets to meet lunar payload delivery and service needs. The agency said it will release a draft request for proposals this spring to initiate commercial lunar payload service contracts for delivery to the surface of the Moon as early as 2019. The company plans to push their Griffin lander forward as a medium-class lander for the NASA call. Between the new NASA emphasis and existing private interest in the company’s capabilities, Astrobotic could be very busy very soon. So is interest by other space agencies in getting to the Moon. In recent years the space agencies of Russia, China, Europe, Japan and India have all announced plans for science missions orbiting and/or landing on the Moon. After years in which a kind of Mars-centric approach seemed to occupy a great deal of energy at NASA and a great amount of media attention in general, a quiet momentum or relative consensus seems to be building that the Moon is the next natural step in gaining the infrastructure, the know-how, and the experience necessary for exploring deeper into space. If this mindset holds, Astrobotic finds itself in exactly the right place at exactly the right time.